Have you ever seen the YouTube videos of traffic in China? Pedestrians, cyclists and drivers alike approach intersections willy-nilly, with no traffic signals regulating them. Sometimes, only human reflexes and constantly honking horns keep crashes from happening. And even with traffic signals and conscientious attention by drivers, crashes still occur. In American cities, local traffic incident management (TIM) centers like TransVista in El Paso are responsible for monitoring the local transportation system and alerting first responders about incidents. Because traffic incidents can be so distracting for travelers — and distractions can lead to more crashes — it’s incumbent upon agencies like TransVista to strive for improved traffic incident management and even reduction where possible. Local traffic management centers like TransVista in El Paso are responsible for monitoring the local transportation system and alerting first responders about incidents. The Federal Highway Administration (FHWA) annually assesses TIM centers nationwide to help them improve operations. 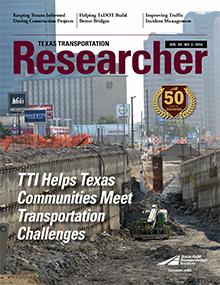 In response to feedback regarding TransVista’s operations, the Texas Department of Transportation (TxDOT) engaged the Texas A&M Transportation Institute (TTI) to help improve TransVista’s day-to-day operations. Currently 11 states, including Texas, are working together to develop nationally relevant TIM performance measures. Stakeholders involved in the process include both law enforcement and transportation professionals. TTI found that TransVista is already good at collecting, integrating and sharing data among local stakeholder groups. The center also has effective procedures for incident clearance. What TransVista needs, researchers found, is to develop performance measures, establish more formal agreements with stakeholders, and provide incident information to travelers. “Several strategies we’re recommending to improve center operations include establishing after-incident reviews, facilitating communication among stakeholder groups, taking a more active role in crafting legislation to mitigate the impact of incidents, and holding coordinated stakeholder trainings,” says Galicia. producing a summary of findings. Phase 2 will focus on developing performance measures that, once implemented, build continuous operational improvements into the agency’s procedures and policies.